Let me start by saying that I’m feeling good about my writers group this morning. Last night one of the members brought a cake to our monthly gathering. 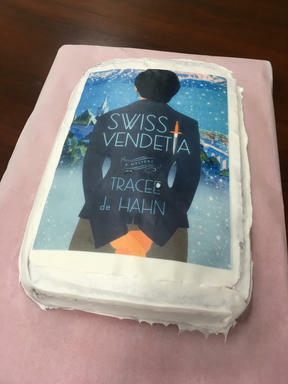 And not just cake, but a cake with my book cover on it! Does life get better than that? We are an open, community based group which means anyone is welcome to attend. There are about 16 on the official roster (which is mine to manage this year) and attendance is good – I’d say we have 11 or 12 at each month’s gathering. We sit at a round table, nearly shoulder to shoulder and it feels intimate without being claustrophobic. Among writers there is a great deal of discussion about support groups. They exist along a spectrum from small and carefully curated to large and open to all. Over the course of many years I’ve decided that there is a place for all types. For me, the absolutely necessary criteria is a willingness for the members to be critiqued and to critique in a thoughtful, receptive manner. Your group may have expertise, and be composed entirely of award-winning authors, but when they gather some of that has to stay at the door. The point of a writers group is to support the other writers (which, of course, means being supported in turn). The nature of the group is to experience small chunks of work. This is not the beta reader group (although you may find beta readers among them). My group is a range of ages, and has experienced as well as fledgling writers. The interests range from poetry to short story, children’s books to memoir, and the full spectrum of fiction (although there is a happy cluster of mystery/thriller folks!). Last night at our monthly meeting we read a suspenseful short story by a man who is diving into the format for the first time, and a chapter from a memoir written by a woman who survived a mass shooting. The short story had problems with point of view and character development, but wow was it suspenseful, and the ending was satisfying. So satisfying that the group agreed it anchor a linked collection. We were excited, inspired and ready to read more about Ruth and Lydia. The memoir chapter read like an academic essay. Thoughtful, thought provoking and informative. There was real information and data there. We’ve read other chapters, the heart wrenching ones that detail the experience of a shooting and the difficulty of living with the aftermath. This chapter was the balance. The reader will need it, otherwise they might become overwhelmed with the horror of the experience. The chapter also illustrated to us that the author understood the need to balance passion for a subject with subjective reasoning. We end our two hours together energized and ready to write – if that’s not a satisfactory writers group then I don’t know what is. It can’t be all things to your work, but it should make you want to keep at it. What works for your writers group?